Looking for something to keep the kids busy while you make all the necessary preparations for Christmas? These great little colouring kits from eggnogg.co.uk might come in handy! We recently received a lovley little bundle from EggNogg.co.uk, complete with Colour-in Christmas Paper Chains, Colour-in Christmas Postcards, Colour-in Christmas 3D Decorations and a Colour-in Dress Up Santa Outfit. These packs were an instant hit with my kids (3 and 5) and would make great stocking fillers! Eggnogg designs quirky gifts, party supplies, greetings cards and colour-in products for all ages. From tablecloths, postcard books, posters, bunting and pocket books to greeting cards, wrap, notebooks and stickers, Eggnogg challenges the senses through colour, texture and humour. We had so much fun with these little packs. On a wet and dreary afternoon, while looking after a friend’s children we put these kits to the test. Who better to try out festive colouring in kits than two 5 year olds, a 4 year old and a 3 year old! First up were the paper chain kits. These are great for a quick activity and make a lovely addition to the playroom this Christmas season! The designs are simple and fun – easy to colour in, perhaps a little tricky for very young preschoolers and the dotted lines made them super easy to cut out! Next we all chose a pull out Christmas postcard from the Christmas card booklet. Each of us coloured in our cards and the school kids really enjoyed writing little messages on the back of their cards. I have kept the booklet in my back over the past few weeks as these little cards are perfect for pulling out and keeping little hands busy while in a coffee shop or restaurant! I really love the fun and simple designs of these cards! The Dress Up Santa Outfit was a firm favourite with my little boy Doodles (5). He thoroughly enjoyed colouring in this cut out full sized santa outfit! He spent many days adding a little more detail to it until it was just perfect. This is a large project and definitely takes a bit of time to complete. It would also be great to leave out on a table during a playdate for kiddies to add to! Finally we tried out the 3D decorations. We did this just before bedtime one evening after a very busy day. It was a perfect wind-down activity! 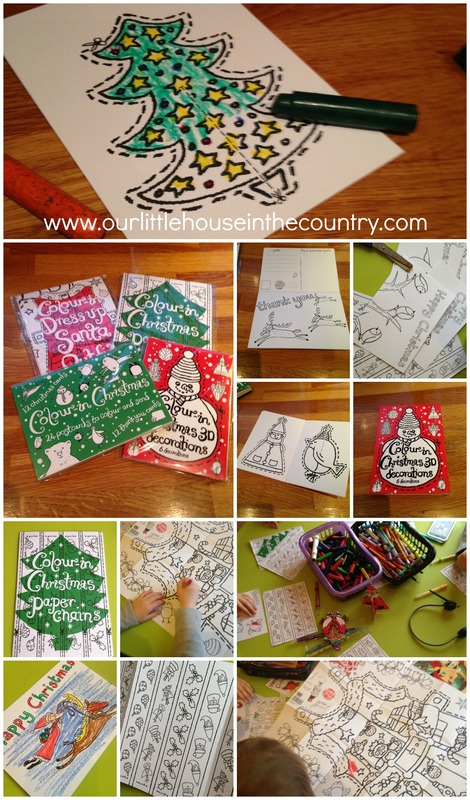 The decorations are fun, easy to colour and cut out and the kids were delighted with their little decorations! These packs are great to have on hand for keeping kids busy at this time of the year especially if the weather is bad like it has been here recently. These would make fantastic stocking fillers or Advent calendar activities or party favours! We really enjoyed trying these products out and are giving them a huge thumbs up! Disclosure: I received these four packs as free samples in return for a fair and honest review. All opinions are my own.